Today many Google plus users started reporting including me that their Google plus profile page showing only 1 follower. 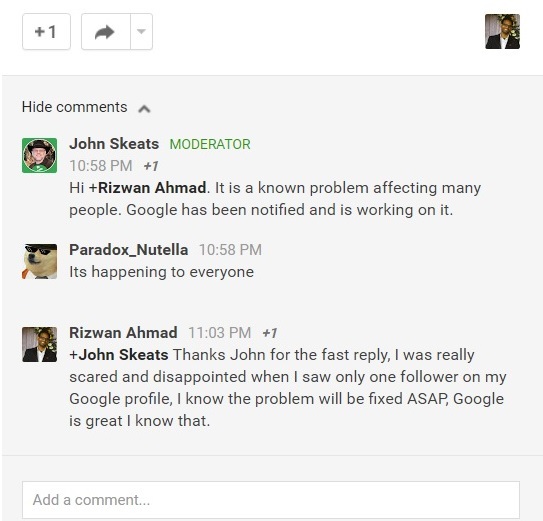 I was also very shocked to see only 1 follower on my Google profile then I visited the Google+ Help community and found that not only me but many of the users were reporting the same problem. We are not sure that what actually caused this problem but we are pretty sure Google will fix this shortly. We also checked profiles of many other people and big media tech channels like Mashable and TechCrunch and at the time of writing their flowers count was showing only 414 followers for Mashable and about 1,383 followers for TechCrunch and that was really shocking for me. We really hope to get this issue solve shortly and we can see our followers back on our profiles.